I made this quilt for a lovely lady in Australia! I can't wait for her to get it and let me know what she thinks, I really do get quite a kick out of sending quilts so far away. She was so nice to wait a couple weeks while I was busy with my daughters wedding. I meet the best people through quilting! The fabrics in this quilt are from Sandy Gervais Frolic line. Very fun and fresh looking. I love Sandy's designs, and have gotten quite adept at spotting the new ones when they arrive in the quilt shop. I think she is one of my favorite Moda designers, though I must admit there are several that I like a lot! The pattern is a simple disappearing nine-patch. It was fun and easy to sew up the top and really looks nice. My next big project is a Wedding quilt for my daughter and son-in-law. I've purchased a fat quarter bundle of Origins for this one, but haven't decided on a pattern yet. Anyone have a good one for fat quarters to make a queen size quilt? I can get some additional yardage for borders, but am just not sure how I want to use the fat quarters and haven't made too many large quilts using them yet. I am glad to have time for quilting again, and am looking forward to some small projects for my Etsy shop. Mug rugs seem to be popular right now and I'm thinking of trying a few just for the fun of it. As well as some mini quilts. I probably won't be making any more of the quilted checkbook covers and wallets, as I've had quite a few of those around for a while and they don't seem to be selling. 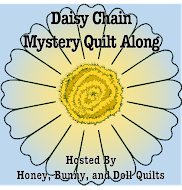 I have a LOT of projects in the works and really want to work on those - I am planning several table runners using charm squares - those are a lot of fun, and I have a couple made up and ready to quilt already, plus ideas for a couple more so far. Just need to make time to do the sewing! Here's to lots of quilting and new projects - may your weekend be a quilting one!